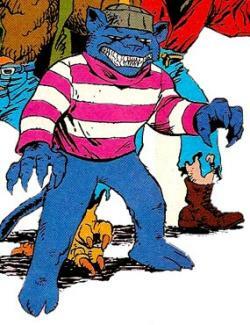 Hallocat is a mutant cat, a member of the Uncanny Trio, and enemy of the Teenage Mutant Ninja Turtles. Hallocat (previously known as ‘Pookey’ before the mutation) was a truckers pet cat, his owner had been illegally dumping toxic waste for a chemical plant whose foreman did not want to dispose of the waste properly in an effort to cut costs. One day, Pookey got under the foreman’s feet, tripping him. In a fit of anger, the foreman picked him up and threw him into a vat of toxic waste (which was actually mutagen). He believed the cat to be killed. Instead, the cat mutated. Hallocat was renamed Scratch for the toy line. He is one of the most sought-after TMNT action figures ever made and can sell for hundreds of dollars in on-line auctions. Very few were produced and he was among the last of the villains to be released. Hallocat (Scratch) appears in Teenage Mutant Ninja Turtles III: Radical Rescue for the Gameboy. He returned briefly in 2009, as a character on a special t-shirt created by Fernando Leon Gonzales and Ryan Brown, as a fund-raising method for TMNT writer Jake Black’s medical bills.